Thame Art Crawl’s event map is now available online, or pick one up from the Town Hall and participating venues. Pick it up and discover the work of over 23 artists across the 12 pop-up art exhibitions around the town centre from 18-21 October. As well as exploring this local talent, Thame Art Crawl is also hosting events that will give you the chance to get involved and release your inner Van-Gogh. Paint your own master piece with Brush Party at The Barns Centre; take part in a ‘Bookish Creatures’ workshop at the Library; or add to a piece of community art with Thame Art Group at Christchurch. Or, if you would rather watch others at work then don’t miss Watercolour demonstrations with George Boyter at fitch & fellows; talks and demonstrations from visiting artist Jeremy James at The Spread Eagle; and demonstrations of wood engraving and relief printing by Christine Tacq, at Glynswood Art Shop. For dates and times of these activities and events go to www.thameartcrawl.com/events. 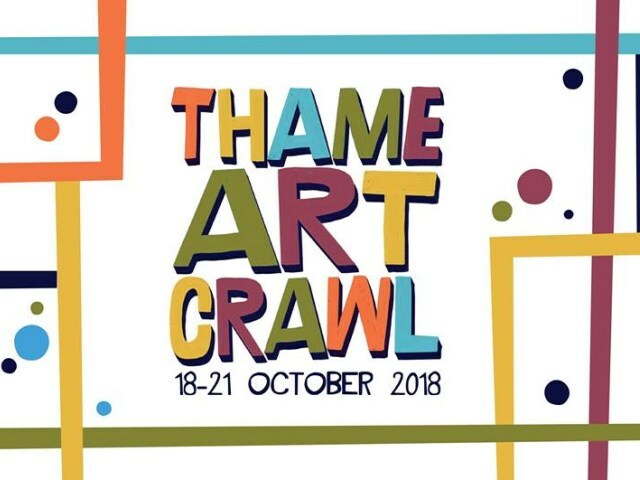 As part of Thame Art Crawl, a competition for children aged 3-10, with the chance of winning a creative prize, is now open. Participants have to find the letters and numbers hidden in Art Crawl venue windows, and use these to solve the puzzle on the entry form. These are available to be picked up from Thame Town Hall, or here.